No matter how hard you try to eat right and stay healthy, there are some days when a trip to the fast-food restaurant just seems easier. So what’s a busy woman to do to fill in those nutritional gaps? If you’re like most women, you’re already taking a multivitamin. But is it really the right one for you? Learn why not all multivitamins are alike and why Vitamin Code for Women is better than anything you’ve tried before. You may think the name-brand store-bought multivitamin you’re taking is the best dietary supplement for you. But are you really getting the nutrition your body craves? It may startle you to know that all multivitamins are not created equal. Most commercial multivitamins are nothing more than a bunch of man-made chemicals created in a lab. That’s right! They don’t even come from food sources. They’re just chemicals. Not only is your body unable to properly absorb these vitamins because it doesn’t recognize them as a nutrient source, many multivitamins also contain harmful additives, colorants, and fillers that can contribute to the health problems you’re trying to prevent. No matter how hard we try and how well we eat, we are going to have some nutritional gaps in our diet. It can’t be helped. Even women who cook healthy, nutritious meals every night still aren’t going to get all the nutrition they need. Why? In this economy, few of us can afford to buy exclusively organic, free-range food or juice our own organic vegetables daily. To get the kind of nutrients provided in just two capsules of Vitamin Code for Women, you’d need to. While there’s no substitute for good nutrition, Vitamin Code for Women can give your immune system a boost, support bone and breast health, and help ease you the everyday stressors of modern life. What Makes Vitamin Code for Women Better? There are many dietary supplements out there that claim to be safe, healthy, and natural. Even though there are plenty of other whole-food supplements on the market, some companies still cut corners and add unnecessary preservatives. The only other ingredients in Vitamin Code for Women besides whole-food nutrition are brewer’s yeast and vegetable cellulose to hold the pills intact. That’s it! You won’t find that anywhere else. Vitamin Code for Women is one of the most comprehensive whole-food multivitamins you’ll find on the market today. It also contains a Vitamin Code for Women exclusive ingredient called RAW Fruit and Vegetable Blend. If you don’t have the time to juice everyday, the RAW Fruit and Vegetable Blend is your next-best option. It contains a potent blend of organic vegetables and fruit that delivers honest nutrition without the expense and hassle of manual juicing. Click on the upcoming link for a full list of Vitamin Code for Women ingredients. Today’s on-the-go woman needs all the nutritional help she can get. 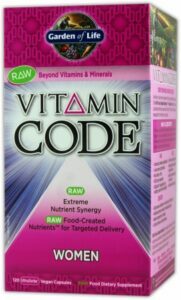 Vitamin Code for Women addresses all of your needs in just one bottle. Whether you’re concerned about bone health, breast health or a declining immune system, choose the whole-food supplement that acts as your ally against disease and gives you the energy you need to go out and conquer the day!